Porsche 996/986 Front Seats. 2-Way power, Black Perforated Leather. Item must not be. FULLY RECLINABLE WITH UNIVERSAL SLIDERS. Fully reclinable with universal sliders. 1 PAIR OF JDM RACING SEATS. BLACK PVC LEATHER WITH RED STITCHING. Made by high quality black PVC leather with red stitching. FULLY RECLINABLE RACING SEATS WITH UNIVERSAL SLIDERS. - Fully reclinable with universal sliders. 1 PAIR OF JDM RACING SEATS 2 PIECES OF RACING STYLE 4-POINT SEAT BELTS/HARNESSES. 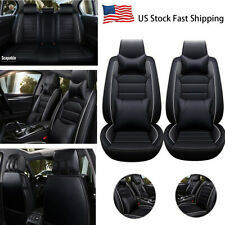 BLACK CLOTH MATERIAL WITH PVC LEATHER PATCHES RACING SEATS. FULLY RECLINABLE WITH UNIVERSAL SLIDERS. Fully reclinable with universal sliders. 1 PAIR OF JDM STYLE T-R TYPE RACING SEATS. BLACK CLOTH MATERIAL WITH PVC LEATHER PATCHES. Made of high quality black cloth material with PVC leather patches. Fully Reclinable With Universal Sliders. Made by high quality black PVC leather with red stitching. 4-point racing harness pass through. Black Quick Release Handle Included. Demo / Installation Video. Reclinable racing seat is adjustable from the handle on the side. Made of high quality black fabric & black PVC leather. 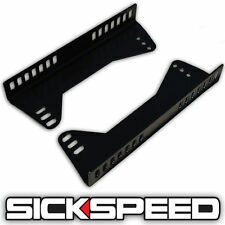 Make your car look unique and more aggressive in racing style, provide best comfort, support and safety during hard cornering and aggressive driving. Certified SFI 16.1. 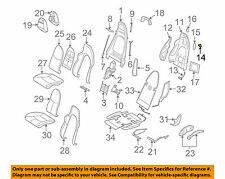 Fit On Most Vehicles With Racing Seat Features For 5-Point Seat Belt Installations. Our office hours are. USED 1997 PORSCHE BOXSTER Front Seat 89659 MILES. Model: PORSCHE BOXSTER. Here at Nationwide Auto Recycling we only buy low mileage auto salvage. We do not dismantle junk cars with high miles. Starting January 2008 we started buying all makes and models to be able to fill all your used parts needs. 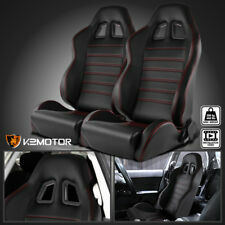 BLACK CLOTH MATERIAL WITH PVC LEATHER PATCHES RACING SEATS. - Made by high quality black cloth material with PVC leather patches. 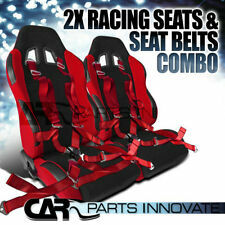 1 PAIR OF JDM RACING SEATS 2 PIECES OF RACING STYLE 4-POINT SEAT BELTS/HARNESSES. 1 PAIR OF JDM RACING SEATS 2 PIECES OF RACING STYLE 4-POINT SEAT BELTS/HARNESS. BLACK PVC LEATHER WITH RED STITCHING. - Made by high quality black PVC leather with red stitching. RED HEAVY-DUTY NYLON SEAT BELTS. 1 PAIR OF JDM RACING SEATS 2 PIECES OF RACING STYLE 4-POINT SEAT BELTS/HARNESS. BLACK PVC LEATHER WITH RED STITCHING. - Made by high quality black PVC leather with red stitching. BLACK HEAVY-DUTY NYLON SEAT BELTS. FULLY RECLINABLE WITH UNIVERSAL SLIDERS. - Fully reclinable with universal sliders. 1 PAIR OF JDM RACING SEATS 2 PIECES OF RACING STYLE 4-POINT SEAT BELTS/HARNESS. BLACK PVC LEATHER WITH RED STITCHING. FULLY RECLINABLE RACING SEATS WITH UNIVERSAL SLIDERS. - Fully reclinable with universal sliders. - Slider length : 14.25"~19.25". 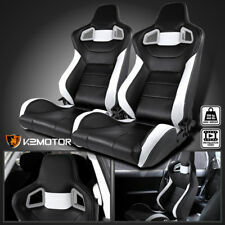 BLACK CLOTH MATERIAL WITH PVC LEATHER PATCHES RACING SEATS. - Made by high quality black cloth material with PVC leather patches. FULLY RECLINABLE RACING SEATS WITH UNIVERSAL SLIDERS. - Fully reclinable with universal sliders. 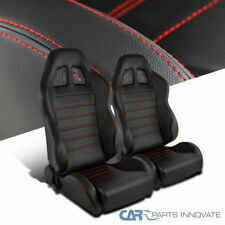 BLACK CLOTH MATERIAL WITH PVC LEATHER PATCHES RACING SEATS. - Made by high quality black cloth material with PVC leather patches.